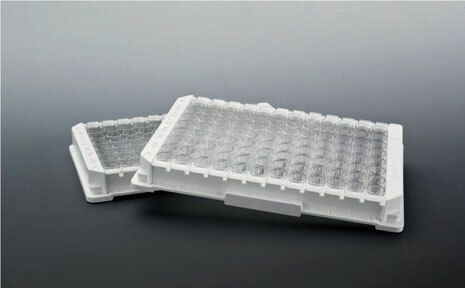 The Streptavidin A plates are available in an F8- or C8-format and are suitable for the binding of biotinylated molecules, such as peptides, antibodies, oligonucleotides and haptens. The Streptavidin A is bound in a uniform layer on the surface of the plate and is offered as a Standard- or a High Bind-variant. The plates have a very consistent coat (homogenity < 3,8 %) and are charecterised by a high binding at low dissolution kinetics.